Medieval Psalter (St Colmcille), Irish Illuminated Manuscript: History, Provenance. Detail showing decoration of Initial. Despite an imprecise provenance, the Cathach of St. Columba became an important relic and talisman used in battle by the Donegal Ó Domhnaill/ O'Donnell clan. Indeed, all of the Donegal clans it in high esteem. During the eleventh century, Cathbharr Ó Domhnaill, chief of the O'Donnells and Domhnall Mag Robhartaigh, the Abbot of Kells commissioned a special shrine (cumdach) for the Cathach. This comprised a 2-inch deep brass box some 9 inches by 8 inches. The lid, decorated with an image of the Crucifixion and an image of St Colmcille, was heavily ornamented with silver, crystals, pearls and other precious stones. In 1691, this unique item of religious art was taken to France, returning only in 1802. It was rediscovered in 1813, when the cumdach was opened. Since 1842 the Cathach of St. Columba has resided at the Royal Irish Academy, while its shrine is on view at the National Museum of Ireland. The text is written in Irish half-uncials (uncials are capital letters, and the word 'uncial' comes from the Latin uncia, 'inch') and illuminated in a pure Celtic style. There are no pictures, or decorated borders: the decoration is purely calligraphic. Only the initial letter of each Psalm in the Cathach is decorated. These initials are inscribed in black ink and are larger than the main text. They are embellished with trumpet, spiral and guilloch patterns and outlined with red dots, a feature which gives the letters a rosy halo. Another typical embellishment is called diminuendo; a large capital letter is followed by a smaller one, and then a smaller one, and so on until the standard lower-case text-size is reached. This Celtic-style pattern-work may owe something to contemporary texts produced in Rome under Pope Gregory the Great, but in any event its motifs soon appear on nearly all forms of Irish Christian art, notably metalwork, Celtic high cross sculptures and illuminated ecclesiastical texts. Although the decorative detail is different from that used in later gospel manuscripts like the Book of Durrow and the Book of Kells - see for example Christ's Monogram Page - many of the Cathach's basic design concepts are repeated and greatly enhanced in later Insular illuminated gospel texts. volumes? See: RARE ART BOOKS. 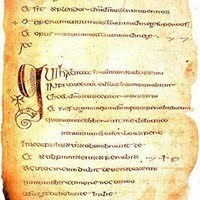 The Cathach of St. Columba is not the oldest of all Irish manuscripts. This honour is believed to go to the slightly earlier Codex Usserianus Primus (also known as the Ussher Gospels, after James Ussher, Archbishop of Armagh), which was created in about 600-610, some years before the Cathach of St. Columba. If written entirely in Ireland, the Codex is the earliest example of an Insular artist replicating the Mediterranean style of decoration. Its decorative features are limited to linear and dot patterns in the colophons, indicating that the Celtic art of illumination had yet to acquire a distinct character of its own. The manuscript has a single remaining decoration, a cross outlined in black dots at the end of the Luke (folio 149v). Initials on folios 94, 101 and 107 are outlined by small red dots. This is the first appearance of this motif which was to become a regular feature of later Insular manuscripts. 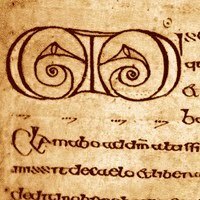 Despite its relatively primitive embellishments, The Cathach of St. Columba was the first Insular Christian manuscript in which graphic decoration began to assume a major role. In this sense it was the precursor to the glorious full-page illuminations of the Book of Kells, and the golden age of medieval visual arts in Ireland.  For information about the cultural and religious history of Ireland, see: Irish Art Guide.